SCOUT (Sentient Co-relator Of Urban Transaction) has come to Takutai Square. Behaviour is regarded as a strong indicator of intelligence. Social behaviour or the hive mind is an area of growing scientific interest. We often imbue technology with the quality of intelligence, while the pursuit of artificial intelligence has long been a driver in the evolution of computing. The growing complexity of computers and software leads inevitably to the notion of the singularity, a point somewhere in the future when computer intelligence surpasses the capacity of the human mind. SCOUT both monitors behaviour and exhibits a behaviour of its own. I posit SCOUT as a benevolent, non-human intelligent entity that engages with its environment and the people within it, transacting in the urban space. It exchanges with individuals and groups of people through sight, sound and haptics. 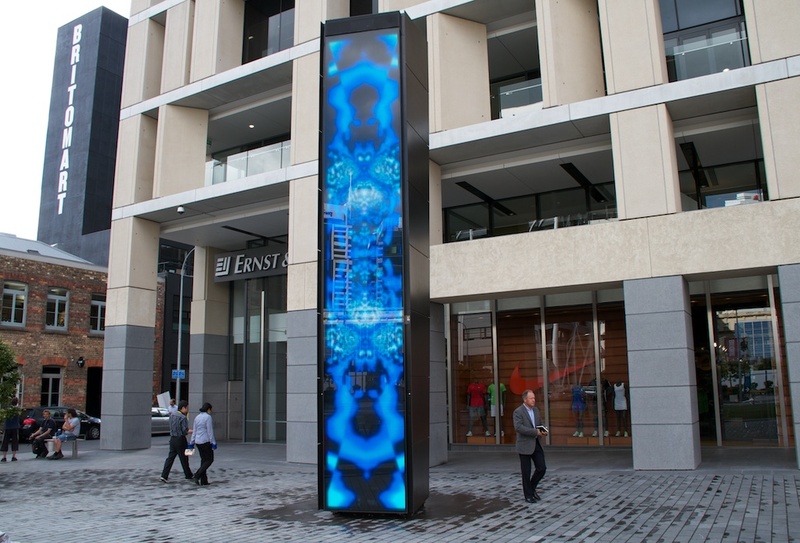 It monitors the environmental conditions in the square - the seasons, time of day, temperature, humidity, brightness and rainfall - feeding back into the square through light, sound and image. It also alludes to an understanding of dynamic systems and interactions that form life. Analysing data, processing artificial life algorithms and exploring bio morphologic transitions, SCOUT translates and combines incoming information that in turn influences its own behaviour. Though at times demonstrative, its intrinsic mode is as a calming presence within the urban-scape. SCOUT has arrived and is now a part of the urban transaction in Takutai Square. SCOUT is unique in the New Zealand art and cultural context. There has never been an undertaking on this scale of such conceptual and technical complexity. The project has necessitated specialist technical support from New Zealand, Australia and China under the direction of artist Tim Gruchy. A broad skill set, range of resources and collaborative modes across interactive technologies, computer programming and architecture have been engaged to realize the final outcome. Conceptually SCOUT’s form developed from an intention for the work to inhabit gently within the existing architectural vernacular, insinuating itself into the environment, yet with a twist. The project has involved close collaboration between the artist and the architects to ensure SCOUT possesses a subtle integration with both the physical architecture and the broader urban relationships and concerns emerging in Britomart. Considerations of locale, structural form, scale, textures and detailing are all apparent. Its primary relationships, however, are with people. Technically the work comprises three simultaneous sets of components; inputs that feed into central processing, through to outputs. The inputs comprise a full suite of sensors with a video camera, microphone and touch-sensitivity being augmented with a set of environmental sensors monitoring temperature, humidity, brightness and rainfall. A clock and calendar also give SCOUT an understanding of the time of day, day of the week, month, year and the seasons. These inputs all combine in a cluster of three networked computers programmed by the artist. Computer One is the brain that orchestras all activity as well as generating background audio. Computer Two listens to the sensors and generates real time generative sound and vision. Computer Three is a vision server that accesses and delivers custom programmed visual resources from a vast library. This visual material is mathematically generated by the artist using artificial life, cellular automata and biomorphologic principles. 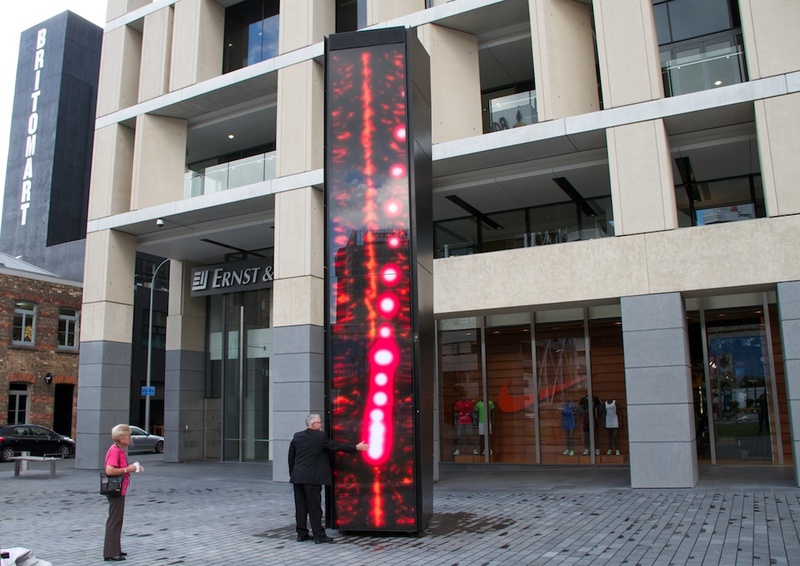 The main output is the eight metre visual screen that inhabits one entire facet of the monolith. It incorporates outdoor LED technology, the only current screen technology visible in full daylight. The artist wished to introduce a softening layer and to register differentiation from ubiquitous commercial signage manifestations in city sites. Hence, the LED image has subtly been diffused using a combination of rear projection material and tinted glass. Additionally, embedded in the form are LED strip lights that extend the chroma of the LED screen. SCOUT possesses a dual audio output system. A set of close field monitoring speakers for the near listener, and a much larger speaker for projecting sound out into the square. Both of these audio systems are augmented by a substantial sub woofer that provides another layer of sensorial experience for the visitor. Working with composer and musician James Pinker and a number of vocalists including Precious Clark, Tim has composed a real time soundtrack for SCOUT that consists of a suite of original music and sound effects. These fall into three categories; firstly a set of songs that SCOUT sings under certain conditions; secondly a complex generative mixer that selects compatible tracks and combines them into variable music in actual time, and thirdly sound effects associated with the real time interactive components.